Based on the famous and my favourite Hong Kong dish – Steamed Fish With Soy, Ginger & Spring Onion, I’ve developed this quick and easy recipe because my steamer wasn’t big enough to fit the fish – I decided to put it in the oven and it works perfectly. Place the fish into a baking tray. Prepare the vegetables and stuff inside the fish and around the tray. Drizzle with some olive oil and cover with foil. Bake for 40 mins, then remove the foil and bake further on fan assist or turn up to 250 for a further 10 mins till skin is golden brown and crispy. In a hot sauce pan, add a splash of oil and sweat the spring onions being careful not to burn it. 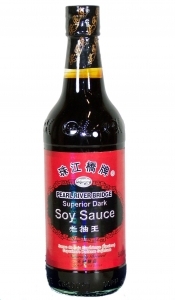 Pour in about 50/50, (estimate 75ml altogether) of a mix of dark soy sauce and light soy sauce or use the Vietnamese brand of soy sauce. Add about a tablespoon of sugar and a tablespoon of cider vinegar or lime juice. Taste for the balance of sweet, sour and salty. If it is too sweet, add more sour, if it is too salty add more sweet, if it is too sour add more sweet. Add fresh chillis or chilli sauce (Sriracha). Then pour all over the tray of baked fish. Garnish with coriander and/or strips of fresh spring onions. Serve with rice or with rice paper to make summer rolls.